Adjustable Door Frame to Fit a Wall Thickness of 4-3/4" to 9-3/4"
Due to the completely customized and personalized features of this item, it requires SPECIAL ORDERING. 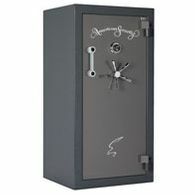 As time goes on, our collections of valuables continue to grow eventually filling up and maxing out our safes. 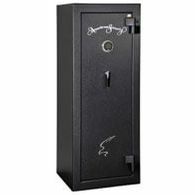 In terms of security, the American Security Vault Door VD8030NF has a two-inch thick door constructed with 1/8" inner and 1/4" outer steel plates filled with fire insulation material in the middle. On the door lies a UL listed Group II lock with a spy-proof ring with the option to upgrade to an electronic lock. Behind the lock lies a tough hardplate and two relocking devices to ensure extra protection during an attack. After the correct combination is entered and you begin to turn the beautiful five-spoke handle, you'll start feeling the ten 1.5" chrome-plated locking bolts retract. As you start pulling the door open, it will just glide on the commercial grade vault door hinges. 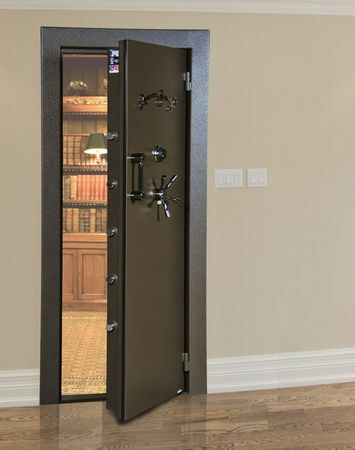 On the inside of the door, you'll notice a Palusol expandable door seal that will assist in keeping both fire and smoke out. Once fully inside, you can close the vault door completely as Amsec geniusly added a safety lock release on the inside that will allow exiting even if the door is closed. 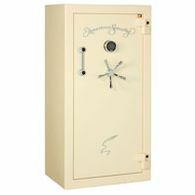 This vault door retrofits into a standard 80" x 30" opening and is designed for easy installation. The new adjustable door frame slides together to fit a wall thickness of anywhere from 4.75" to 9.75". These vaults come in a beautiful textured finish and with several different color options, you'll have no problem fitting this into any home decor. 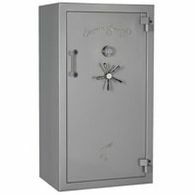 The AMSEC Vault Door VD8030NF is backed up by AMSEC's No Cost, Lifetime Warranty against break-in, attempted break-in and fire.